Welcome to any new visitors to our permaculture blog. We’ve placed an ad in the latest issue of Permaculture Magazine with the aim of inviting more people to read our blog and offer advice, encouragement and inspiration. So why the blog? Stuart’s done a Permaculture Design Course with Patrick Whitefield and we’ve got a collection of books and a minimum of experience growing some vegetables; other than that, we’re beginner’s in all of this. We hope that other beginners may be reassured by our stumbling progress and inspired to give it a go, rather than be put off by the perfection of the experts. (See Liam’s comment on the 28th June blog, and my posting of 13th July in reply). We could also do with any help you have to give. Turning theory into practice isn’t always easy, and instructions have an annoying habit of often missing a vital detail. An example is our first attempt at growing potatoes using a “grow through mulch”. See pp194-196 of Patrick’s “The Earth Care Manual: A Permaculture Handbook for Britain and other Temperate Climates” for an explanation. 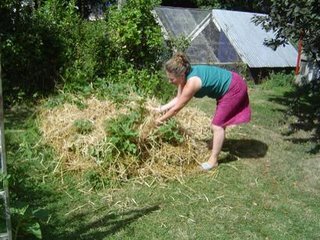 Basically, we’ve covered the ground with sheets of cardboard, then a layer of compost, placed the seed potatoes on top and covered the whole lot in straw. And the book says: “Extra mulch is sometimes needed later on, when dug potatoes would need earthing up.” (p.196) Why sometimes and not others? What should we look for? Having never grown potatoes before, we don’t even know when “dug potatoes would need earthing up” by way of comparison. After just a few weeks, Gabrielle was ferreting around in the straw for evidence that something was growing (neither of us have much patience, unfortunately) and got all excited to find our first tuber, only to discover that it was, in fact, the seed potato! We get to check them first, so there will be a delay before your comments appear. I am in scotland at present, but interested in a warmer climate. Do you need anyone to join you, is there a possiblity to create an eco neighbour hood where you are? Are you near the sea? I am a gardener a handyman and cook! Andrew, thanks for visiting our blog and getting in contact. We don't actually need anyone to join us, in fact, from a permaculture perspective, we should be designing our system around what the two of us are capable of maintaining ourselves. However, you would be welcome to book some time in our little holiday gite . We would be happy to spend time with you showing you the site and discussing our permaculture planning processes and you'd be welcome to join in with any tasks we're doing. We chose this area as, although we live in a small village in the heart of the countryside, we are just over half an hour's drive from the lively city of Rennes in one direction, and about the same to the beautiful coast in the other. Our nearest town is the medieval town of Dinan. Not far from here is an ecological new estate of twenty self-build houses, and another of about seven, which is a reassuring new trend. I find the concept of eco-villages attractive and if you do a Google search you'll find plenty of France-based (or Spain/Portugal) stuff to follow up. The Dharma House Community Project might interest you. Their website says, "we are looking to find people interested in visiting and helping to establish a ecologically friendly Buddhist inspired community near to Nimes in the south of France. We will be starting up our project from May 2006 and welcome visitors from this time." Hope this helps, and we would be very happy to welcome you, if you want to book some time in our gite. Just rec'd our copy of Permaculture magazine and your entry in the property section caught my eye immediately. We've just come back from a week in Dinan, we're in the throes of deciding whether to move to France and we've been interested in Permaculture, organic food and being self sufficient in veg for a few years now. We also lived in Hove (and worked in Brighton) until 2000 when we moved here (Seaford). Enough coincidences for me to send this, my first foray into the world of the Blog. So here goes. Potatoes - the fourth year. We decided to mulch ours with cardboard and straw this year. Unfortunately it didn't rain enough to soak through the cardboard and we ended up having to take it all off so we could water them. Despite our efforts with the watering can, all the foliage had died down by the end of July - even the maincrop ones and so we dug them up. They're all sprouting now because it's been such a warm autumn. You win some, you lose some. There's always a positive though, at least we didn't have a slug problem with it being so dry. This was on our allotment and the guy next to us (very experienced) advised us to put loads more organic matter in there and grow Grazing Rye in late summer to dig in before planting. His potatoes looked wonderful and he didn't water them once! If only we'd known. It's a bit of a steep learning curve, is gardening. If only we could predict what the weather was going to do. I'll be very interested in reading the rest of your website over the next few weeks. Bye for now. Hi Zoë, and thanks for your comment. In fact, the ad should have been in the "holidays" section, not the property section, as we're here to stay! We hope you liked Dinan and if you come back to this area, do come and visit us. 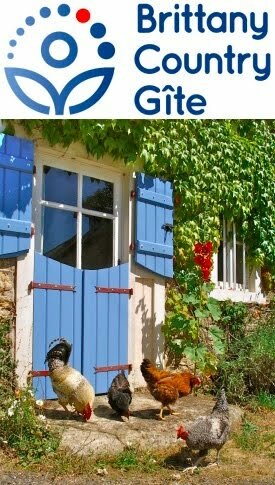 Check out our holiday gite if you need accomodation. Thanks for your tip on grazing rye. With your cardboard mulch, did you make holes by each seed potato? If the water could have infiltrated through those holes, the mulch would have worked to prevent evaporation and keep them moist. As you say, "you win some ..." and just about everything we do is a learning experience. As Patrick says at the end of the introduction to his book, "welcome to the experiment". I hope you keep reading and posting comments ... and keep permaculturing! Bonfire Night sounded wonderful - you have obviously met some lovely people there. Re: the pots/planting hole....as we'd had hardly any rain over the winter and spring, we waited until some growth appeared, so that if we had any rain, it would moisten the soil, then put the cardboard on in between the rows,finally covering everywhere with straw. We had such light showers and so much heat from the beginning of June to end of July we watered with a can around the base of the plants where there wasn't any cardboard.In fact, it didn't rain at all for about a month.We talked about what to do with them almost daily - our surrogate children! It's reckoned that Brittany is wet and windy - have you found that to be the case? We've got 5x 220litre rainwater barrels connected to our roof and greenhouse and these lasted quite well, but all ran out in the middle of the dry spell. Now, they're all full after the autumn rain aha! Water supply is becoming quite an issue here as the aquefers are very low underground even though the reservoirs have been topped up in the last few weeks. I'd be interested to hear how you fared last summer, On the Waterfront.